DOUBLE LAYERS: Brilliant designed organization system holds multiple items firmly in place. Double layers section the bag for preventing unwanted extrusion and scratches to your items. 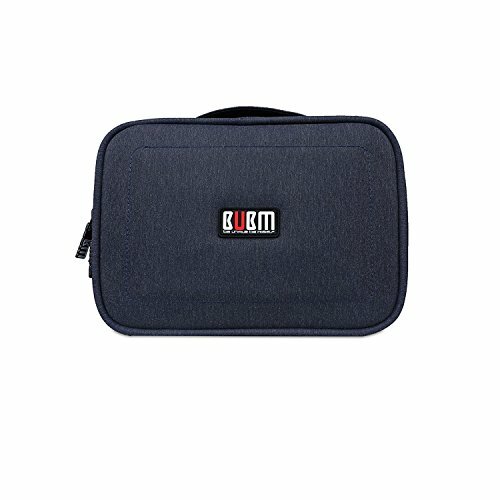 MULTIPLE SPACES: 11x elastic loops for holding various items like cables, pens, small tools and etc; 5x easy access mesh pockets for storing USB flash drives or other small accessories; Medium zipper pockets for holding 2.5 Inch external hard drive (HDD), power bank and etc; Large zipper pockets for holding iPad Mini or Kindle. DIY SECTIONS: Comes with 3x easy detachable anti-shock foam strip. Perfect for separating your items in different sections on your own way. HIGH QUALITY: Made of durable and waterproof nylon in order to safely storage your items. Used for home storage, travel organizer and gifts to friends.